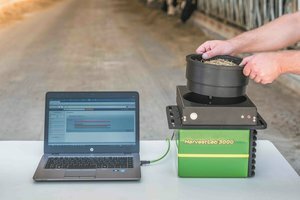 The new HarvestLab 3000 can be removed and utilized in stationary mode to evaluate forage quality at feeding. John Deere has introduced HarvestLab™ 3000, a solution designed to help beef and dairy producers monitor forage constituents at harvest. The tool can also be used in stationary mode to measure forage nutrient quality, which can be helpful to producers during livestock feeding. HarvestLab 3000 utilizes Near-Infrared Spectroscopy. This technology allows it to evaluate factors such as moisture, dry matter, protein, and more. With this information, operators can take more frequent, representative samples over time. While out in the field, broader light spectrum can measure up to 10 nutrient values 4,000 times per second. In turn, operators get permanent, real-time data gathering for their production needs. They can also make adjustments on the go as necessary with constituent measurements. While in stationary mode, operators can analyze all of their food rations for fiber, crude protein, and other characteristics. With this information, they can reduce feed variability for the utmost efficiency. For more information on HarvestLab 3000 and all of its features, speak to your local John Deere dealer or visit www.JohnDeere.com.